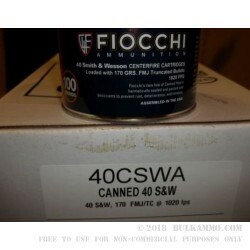 A fantastic 40 cal round for shooting out of any mainstream gun, including carbines. This is a full metal jacketed projectile in a brass alloy jacket with a 170 grain buildout, that offers exceptional reliability and great consistency out of the barrel. The unique part of the line though, is the Canned Heat’s packaging choice that allows a lot of flexibility from the round in that it can be stored for a very long time without degradation brought on by moisture or oxidization that many rounds are subjected to while sitting on a shelf for the long term. 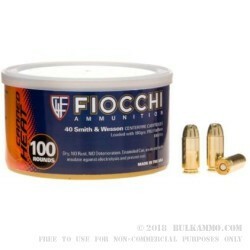 There is a great parity with the ammunition from Fiocchi’s Canned Heat line, price wise with the other competitors, which makes Fiocchi the obvious choice given the solid reputation of the ammunition and the company and the improved container for packaging/storage. Ordinarily Fiocchi is the low priced leader among the mainstream manufacturers, now it’s priced at the same level, with a better package. This is obvious value. The Boxer primed brass case is definitely a reloader’s friend and for the shooter who is also a prepper, this is an ideal option. This is 100 rounds loose in a small can, hermetically sealed to the elements.